Critically-acclaimed crime drama Breaking Bad is getting an unexpected follow-up that is being overseen by the show’s creator. Set after the events of the series, the movie will revolve around Jesse Pinkman as he tries to escape his life of crime. Spoilers for Breaking Bad ahead. The Albequerque Journal, the newspaper of the town where Breaking Bad is set in and was almost entirely filmed, got wind of there being some sort of follow-up movie to AMC’s hit series codenamed “Greenbrier”. Per their sources, the project “tracks the escape of a kidnapped man and his quest for freedom”, according to its logline, and will be filmed between November and February. Fans were able to put two and two together and figure out that this situation would be eerily consistent with what happens to deuteragonist Jesse Pinkman in the series finale. Now that the cat’s out of the bag, The Hollywood Reporter added some more details on the project: series creator Vince Gilligan is scripting and executive producing the movie as part of a larger deal with Sony Television, and he may even direct it. As of right now, it is not clear if this two-hour movie will be released theatrically, or if it will be developed exclusively for television. 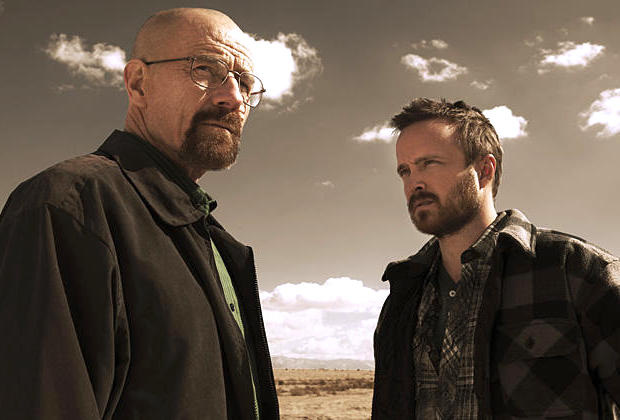 The article also mentioned that Bryan Cranston, who portrayed the show’s protagonist Walter White, has been contacted about the project; although he does not know if he will be needed (since White died in the series finale), he has stated that he will be willing to return to that world if asked. And now, Slashfilm has added another big detail to the mix: Aaron Paul will be reprising his role as Jesse Pinkman. Considering that Cranston has been told about this project, it only makes sense that they’d have the show’s other lead actor in orbit around the project as well, particularly since the movie involves his character at the center of everything. The finale had Pinkman narrowly escaping the fate of being a drug-manufacturing slave for a Neo-Nazi gang with some assistant from his former-employer-turned-mortal-enemy Walter White. The last shot of Pinkman has him hijacking a car and maniacally, joyfully laughing as tears stream down his face – he’s lost nearly everything he’s ever loved, but he at least he’s free, and he has a shot at salvaging what’s left of his life. And it appears that the movie is going to pick up right where that ambiguous, bittersweet finale left off. The untitled Breaking Bad sequel is in development from Sony Television, and possibly Sony Pictures if the project sees a theatrical release. No release date has been scheduled. Aside from Breaking Bad and this new project set in the same universe, fans of the show can catch the prequel, Better Call Saul, on AMC. The spin-off has just wrapped up its fourth season, and has been renewed for a fifth.